Hillary Clinton announced today the appointment of Howard Lehr, M.D. as her new principal consultant on national healthcare policy issues. Dr. Lehr, a retired family practice physician now living in southeast Florida, has been a long time supporter of both Hillary and Bill Clinton's efforts to make the highest quality healthcare affordable for all American citizens. "I've seen a lot of different plans proposed over the years, but I believe that Ms. Clinton has finally come up with a core of ideas that will revolutionize the way we administer health care in this country. I look forward to the opportunity to be a part of the team that will shape healthcare policies in the new millenium". 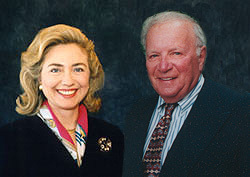 When asked why he decided to leave his quiet life as a husband, father, grandfather, musician and golfer to enter into the tough world of politics, Dr. Lehr said: "I've been waiting for a politician to come along with whom I share moral, political, and personal views... and Hillary is my gal!" 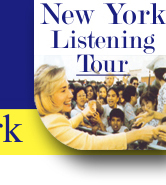 Before joining Ms. Clinton's team, Dr. Lehr will take a short fact-finding tour of Europe. 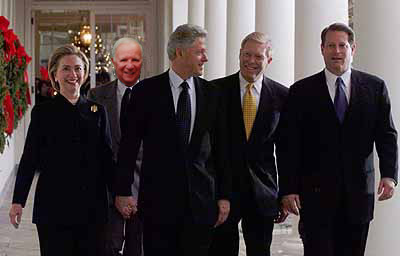 Dr. Lehr seen with other members of the Clinton's "Inner Circle"